Sure, the Hugo Awards have a prize for everything from Best Novel to Best Semiprozine to Best Fanartist. But what about an award for oddest use of steampunk? Or one that acknowledges how much we dig Doctor Who? 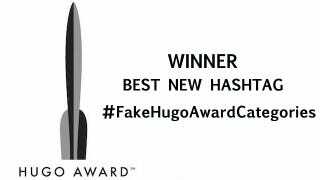 Hugo Award-winning author Tim Pratt devised the #FakeHugoAwardCategories hashtag on Twitter, and it's a riot seeing what folks are coming up with. If you follow the Hugos and other genre awards, many of these categories will jump out at you as all too true. Others are just goofy and fun, with plenty of skewering of science fiction writers and writing.